All deadlines related to the holidays and school are taken care of. Pieces for winter shows are all framed and installed. So it should be time for business as usual. Have ideas for a few new prints, but before I get to those, I still have one old bit of business to deal with- the mermaid. At this point I felt it was mostly done, but a few more things were needed. 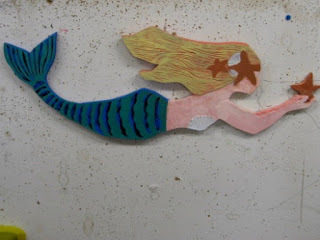 The color I had mixed for the starfishes was reasonable for such creatures but I thought the piece could use more contrast between those and the hair, so I had planned to make it darker. And while I had colored the 1/2" wood edge in some places, I hadn't got to it in others. So that lets you know what I attacked today. 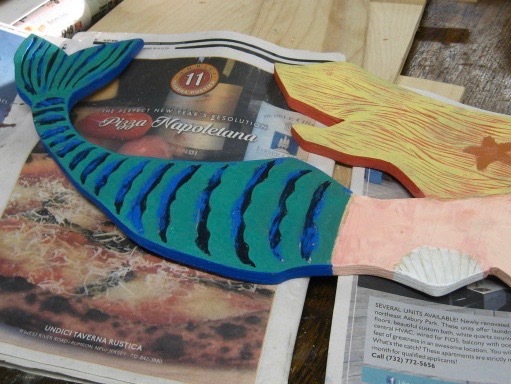 In terms of colors, I went from lighter to darker, so first was the white edge along the giant scallop shell bikini top, and then I gradually mixed various browns to repaint the starfishes. The most common starfish color around here is probably somewhere between what I had and what I've turned it into, but there are thousands of species all over the world and they can come in any color you might think of. I ended up making it more brown than they were, mostly to create more contrast between the starfish and the mermaid's hair. 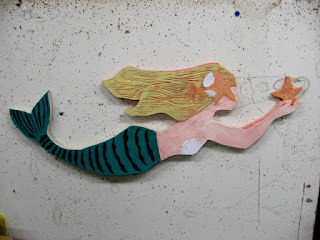 The last step today was to finish putting some color on the wood edge all the way around her tail. I had done some before, a mix of pthalo blue and white, but had stopped because much of the other color was still wet and I had no safe way to hold it while I painted the edges. All dry now, so I mixed and applied more of that color. Had some extra so I applied it to spots on the tops surface that showed bare wood. Figured it fit in with multiple color layers common in fish bodies. Below you can see the whole thing. Left it in my drying rack for now. Based on past experience, this could take a few weeks. It would be much better before it's fully dry before I take it anywhere or try to hang it on wall. Expected snow didn't quite show up today- just a few flurries. So no digging, and more important, I could easily go out. One of my errands today was to go to the Belmar Arts Council to check out the debut of the new member salon show, with the theme of "Blue". It seems to be almost an exact copy of a youth art show they put on last year, just with adults making the art this time. Too good of a theme to pass up. What is blue? In this case any connotation you can think of works. So the art could be something predominantly blue in color, or could reference an emotional state, and the proposal even mentioned the association with blues music. I could probably dig up past work that hit any of those concepts, but the musical one interested me most. I did weekly radio shows for 8 years in college, playing nothing but blues music, ranging from primitive acoustic stuff from the 1930's to contemporary releases that came into the radio stations. And my music collection still includes several dozen blues albums on vinyl and disc, which get listened to at home and in the Studio regularly. As a dj, I produced posters for my show, things designed to be photocopied on standard sheets of paper. 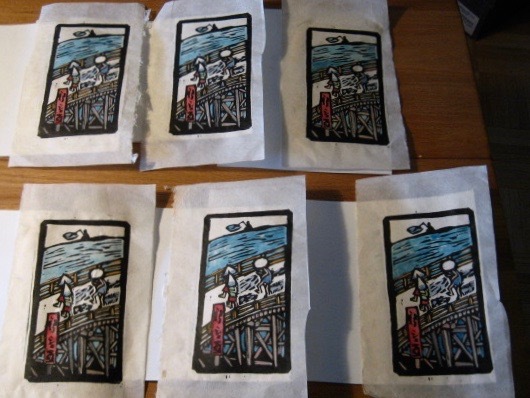 I still have some of those originals, so I could have provided an etching or monotype blues poster. 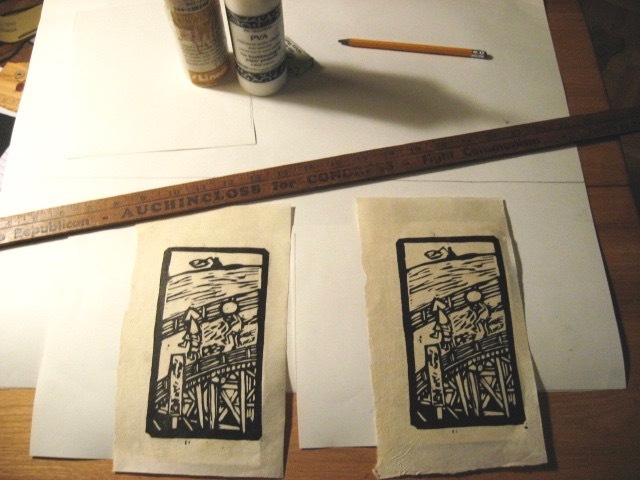 Instead I went with a chiaroscuro relief print done as a demo piece for a linocut workshop I was planning to teach out of my space there in Ocean Grove. For that occasion I reworked an image I had first done in Montclair, based on a photo I took of a live musical performance in Philadelphia, but cut the subject from a duo to just one guitarist, mostly because the piece of linoleum was so small. 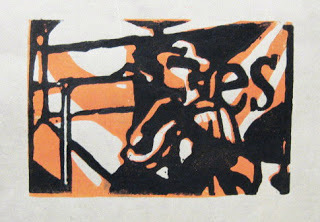 Two printed colors (indigo and orange) plus the natural paper color. Framed for the first time for he occasion of this show. My contribution can be seen below. The exhibition officially opened to the public today, but the important day is this coming Saturday, January 20th, when the Salon event occurs- participating artists can introduce, explain, or even take questions about their piece. 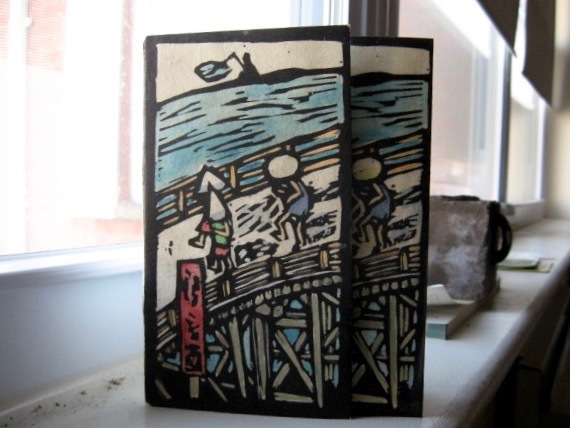 Sounds like a good occasion to mention the planned future printmaking show, and my intention to hold a woodcut class or two to help interested people create a piece of art for the show. I'll probably leave the record at home. I had not gotten around to finishing the framing of my piece for the Salon show in Belmar, but today was the intake day, so I had to deal with it. Not particularly difficult. Measuring the frame right there in the Studio, I found it to be 11" square, so I had cut a piece of mat board that size and put my window in the center. Brought the mat, the frame, and the print home and set them aside until this morning. Opened up the framed piece I was taking apart (a Birds and Seeds print) and found the print was mounted to a backing mat, which was further backed with a piece of foam core, so I was able to remove the print still attached to the rear mat, and still had the foam core and the glass remaining. My new window mat fit the frame perfectly- no additional trims needed. I made linen tape hinges to attach the print to the window mat, put it all together behind the glass in the frame, and it looked just fine. Job done. I drove over to Belmar in the afternoon. Light off and on rain, but I had packed my piece to protect it. Only a few people present, including Denise Van Dyke, the show coordinator. I know her originally as one of my Belmar print students from years ago, so once we had settled the new business, I told her a little bit about the plans for the fall print show in Belmar and to look for announcements. She then had some ink questions, as she had bought a few cans of Daniel Smith relief ink just before they ceased manufacture of it, and is down to her last can. I gave her a few tips. It looks like this show got a good response and should fill both front and back galleries very nicely. The show opens this coming Wednesday, and the reception and Salon will take pace a week from tomorrow. I told her I plan to be there and participate in the discussion. Next deadline on the agenda is preparing a piece for exhibition. I already submitted and paid to be part of the next show in Belmar, and works are to be dropped off in a few days, for a show that opens middle of next week. This is the annual year opening salon style show, where artists are encouraged to present their piece in the reception and talk about it. Theme this year is "blue" and I decided to go with a musical related concept, a print based on a photo I took of blues guitarist John Cephas at the River Blues festival in Philadelphia back in 1990. I have never shown this piece before, which can be a good thing, but it also means I don't have one framed yet. Dealt with that issue today. Today happens to be the nicest day we've had around here in weeks, which is easy to do when we went through two solid weeks below freezing. But now the super frigid air has retreated for a few days, and last night's threat of snow never quite materialized, so I figured I could handle a run up to the Studio. I don't have a frame and mat designed for this blues piece. I could find a frame, but the mat would have to be custom cut, which requires my mat cutting machine, and I keep that up at the Studio. When I got there I found the parking lot was clear (no sun in winter, so I had a few doubts) and there was no problem. I had brought the print and a suitable sized piece of mat board. Unfortunately I was lacking a standard x-acto knife, which I would have used to cut the basic mat shape. 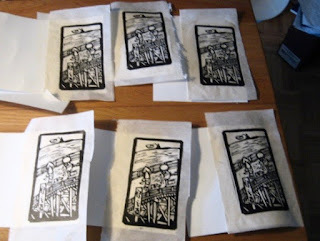 All of those were with my woodcut tools, all left at home since the last time I had to cut a block. Used to leave that kind of stuff there in my cabinet, but I've needed them for local classes and such and have been keeping them at home. Still, that window mat needs to be cut and I could still do that. I set up my mat cutting machine, used a pair of scissors to cut a basic rectangle of mat, used the straightedge I keep in my car to measure and mark the window on the back of the mat board, then cut the window to my desired size. It's the one part of the process that I can't do at home. I put everything away, cleaned up, packed up, and headed home. I can cut a new backing board, tape the print in place, trim the mat to fit in the frame, and put it all together, all at home. That is the plan. The record setting cold weather continues around here, so it's no time to go for long hikes in the country. Got indoor things to do as well, so today I decided to finish the 2nd batch of Christmas cards. The last bunch of tasks was to make the cards and color them. Following the same procedure as the experimental batch from last week. Had 6 more printed copies on the Japanese paper, so glued those to small pieces of bristol yesterday, and left them to dry overnight. With those safely dry, I started coloring them this morning. (had all my watercolor stuff at home still, so I didn't have to venture out into the below zero temperatures) Did it assembly line style- one color at a time for the whole set, then on to the next color. Got all 6 done in about an hour and a half. Tomorrow is still expected to be brutally cold, so probably a good day to finish the job- fold, trim, and then write them out. Three of these cards are already accounted for, while the rest are available if someone deserves one. I can put those three out in Monday's mail. Weather can change rapidly, especially when you live close to the coast. 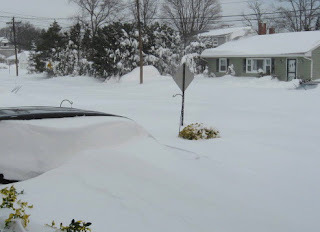 What had been mentioned a few days ago as a possible brief snow in our area was suddenly being called the worst possible winter storm in history, a term commonly being thrown around was a "bomb cyclone". Luckily I had no where I had to be today anyway. As expected, snow had started falling overnight, so we had a decent covering on the ground when I got up, and it just kept on coming. Snow was still falling in the late afternoon, winds were whipping everything around. Morning attempts to clear the sidewalks and parking lots at my apartment complex were wiped out by afternoon. Television couldn't show us enough scenes of massive snow drifts, plows getting ready to jump into action, alarmed reporters- your classic winter storm coverage. But this has all happened before, and it probably will again. I had never heard the term "bomb cyclone" before, but back as 2010 turned into 2011 we had what was called by some a "blizzicane." That's because we had a snow storm that also happened to be a category 3 hurricane. Today we got about a foot of snow, but that time is was 2 to 3 feet. The photos below are from that storm. That the streets weren't plowed is mostly because the town's snow plows were disabled by the storm in the first few hours. Eventually they would just drive a backhoe down the street, creating a crude vehicle path in the deep snow. 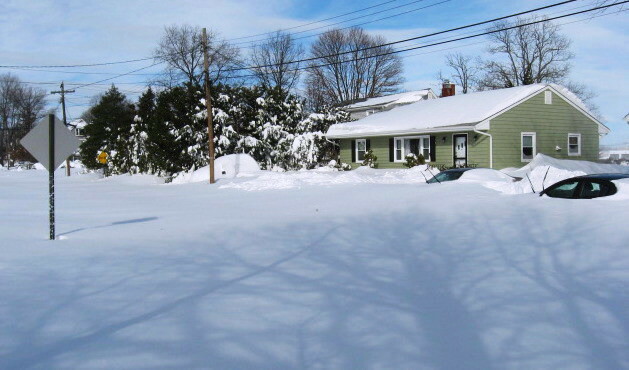 Of course, here you can't even see where the streets would be. And it's not easy shoveling when the snow is above your head. Obviously I survived that storm, and I will survive what happened today. Snow stopped falling and being whipped around by wind by late afternoon, and the plows returned around 4:30, removing enough snow to get to my car. Dug around it a little, but not enough to move it, which was fine because I had no where I had to be. In the morning I continued work on the holiday cards, picking up where I had left off last night. The glue was all dry and everything seemed stable, so I got out the watercolors and colored the two cards I had started making last night. 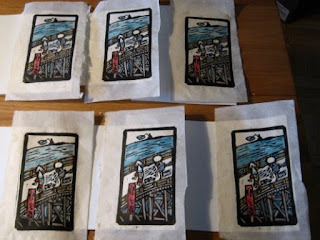 Did them in stages, one color at a time and letting them dry, as this Japanese paper can be a bit tricky. When both were done, I folded and trimmed the cards, In that final state, it was not obvious that this was two bonded pieces of different kinds of paper- it seemed like it could have been a heavy paper with one relatively rough side. Not the most careful and precise coloring job I ever did with this kind of paper, but good enough for this project. Below is a photo of the first two, taken on my windowsill where the daylight could light it. Aspects of tomorrow's forecast are still up in the air, but at this point everyone agrees that significant snow is arriving tomorrow and it seems unlikely I'll be going out tomorrow, so I expect I will try to work on the rest of the cards. I'm sure I can get the assembly done on the remaining six copies, and maybe some or all of the coloring. I'd like to get them in the mail by the beginning of next week. With possible bad weather coming around tomorrow, today was a day to get things done. It was sunny with highs in the 30's, so the nicest day we've had in a week, or probably for the next several days. Roads were packed with panic buyers, and it was almost impossible to get into some supermarket parking lots. (I bought my milk yesterday, so I didn't have to fight anyone for it today) One of many stops I made today was in Belmar, making my payment for the next show, the annual Salon style show. This has been the custom there for the past several years, opening the new season of exhibitions with a Salon show, which is an open show (non-juried), where participants are invited to present one of their pieces in the show, take questions about it or their process, etc, all during the opening reception. These shows generally have some kind of theme, and this year it will be "blue". How to interpret that is up to the artist. I like the color blue, but don't do many monochromatic pieces. However for me, this could only be relating to music. Been a huge fan of blues music for a long time, including being a radio disc jockey playing only blues music weekly for several years, at colleges across the country. 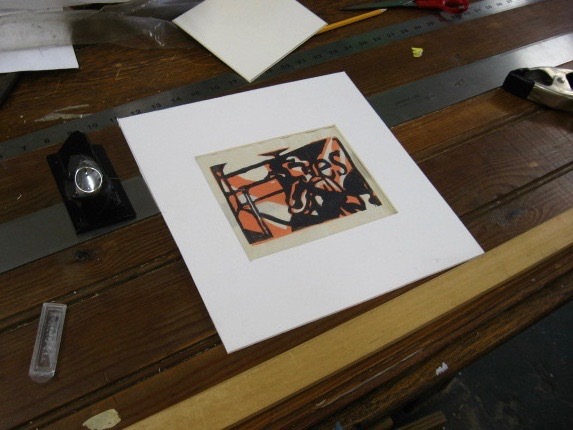 That included making posters for those shows, which might be etchings, monotypes, drawings, or whatever made sense. And then sometimes I just made art, usually based on photos I took of musicians at work. For example, I put a photo I took of blues duo John Cephas and Phil Wiggins in Philadelphia to use in a few art projects, starting around 1990 when I took the original photo at a blues festival. I put part of that photo to use again several years ago (just Cephas in this smaller work), a demonstration of a two block/chiraoscuro print done for a linocut workshop I would be teaching. 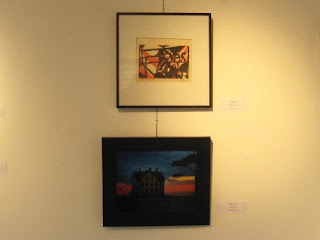 In the above image I have an orange block and an indigo block, plus the white of the paper. That's the one I'm going with. The show will start on January 17th, with that salon on January 20th, from 5 to 7 pm. Staying just as cold as it's been, but at least it's not snowing, and all my fall semester stuff is officially done, so I can devote at least some of my break between classes to going back to being an artist. When several attempts to print my holiday card directly on a stiff card stock did not work well, I started thinking about an alternative strategy. I did eventually get one complete proof, but in the week since then, I've had time to work on other ideas. With school done for a little while, and a need for several more completed cards, today I decided to explore a new option. Last week I started that process, pulling 8 proofs of my card image on some student-grade Okawara, a tissue thin Japanese mulberry paper. 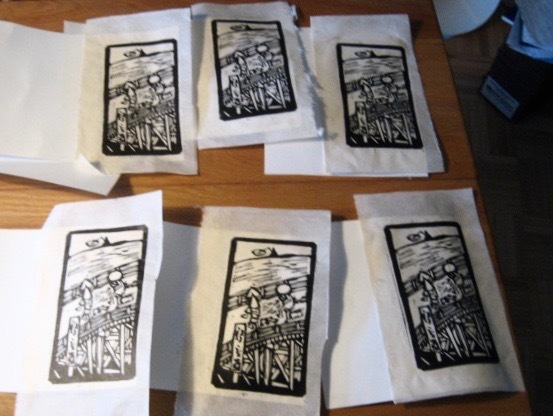 As long as one is careful not to rub the print so hard as to tear the paper, always prints very clearly and easily. However, it's way too thin to be considered a "card", so the prints would have to be mounted on something else. Decided to use more of the bristol board type paper I had tried to print on before, so this afternoon I found a rolled sheet and began the process of straightening it out flat. Once that was satisfactory, I cut off a piece, and cut that into smaller pieces to be turned into the cards. I decided that the printed pieces were dry enough to experiment on. I know that watercolor works well over the oil based ink, and that with care one can hand color this type of paper. I suppose that I could have just colored those 8 proofs, but then I wondered about mounting them and if it could be done without damaging the watercolor. Figured it would be safer to mount them first, and color after. So I took two of my new card stock pieces and thinly spread some Polyvinyl Acetate over the place where the woodcut would go. PVA is basically a fancy white glue, but a pH neutral one that is used for art purposes like bookbinding, etc. It certainly sticks paper to paper, so I carefully placed my proofs on top of the cards and pressed them down. None of the PVA seemed to seep through the paper, so for now I will assume that I can color the surface as I would expect to. Going to let it all dry overnight and try coloring tomorrow morning. It doesn't take long, and once the watercolor is dry I should be able to fold, trim, and write out these latest ones. If it all works, I have materials to make six more, a good activity if I'm trapped at home by a blizzard on Thursday, which the news thinks could be a possibility. More than enough for the people I still owe them to, and if I need more than that, I could always print them on a nicer day than the ones we're expecting. Some super cold air has come to this part of the world, and we won't see temperatures above freezing for this week. In fact, we'll be lucky to get above zero some days. Luckily I got the heat fixed in my apartment a few weeks back when it was only slightly cool, so I am comfortable whenever I am home, and I've had to devote hours every day this week to working on my fall semester grades. But those are done now, so I can go back to being an artist tomorrow. Weather like this is murder on car batteries, so I do like to take it for a ride every day, and this afternoon that was a run up to the Studio. Normally by the first of the month I owe my share of the Studio rent, but as I wrote last night, I had no idea if Molly had gotten around to renewing our lease for 2018. I wasn't expecting to find much there today (being a holiday, the building may have been locked up), but I had to take a ride anyway. The engine was very slow to turn over, but it did start so all was well. I got up to the building and was surprised to see the gates open and some cars in the lot, so I went inside briefly. Not many people were around, and no one who knew anything. Our lease renewal form was in our space where I last saw it. So I went home to continue my grade labors. Plus we have the seasonal Twilight Zone marathon going on this week. In the early evening I reached Molly by phone (this is good staying home weather) and she claims that everything's all set for the year, continuing at the same rate as last year, so I told her I'd try to get my check up there within a few days. Meanwhile, I persevered and got my grades calculated and submitted this evening, plus confirmation that they were received. So maybe tomorrow I can finally finish up my cards and start getting those out, and soon finish that mermaid and get that to where it's going, and start thinking about the next prints.